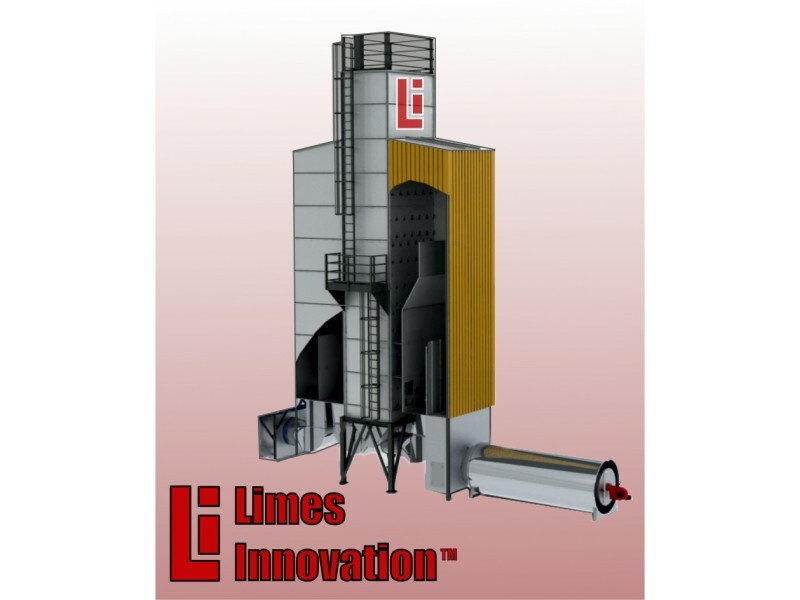 Our LI dryers are made of high quality galvanized steel. 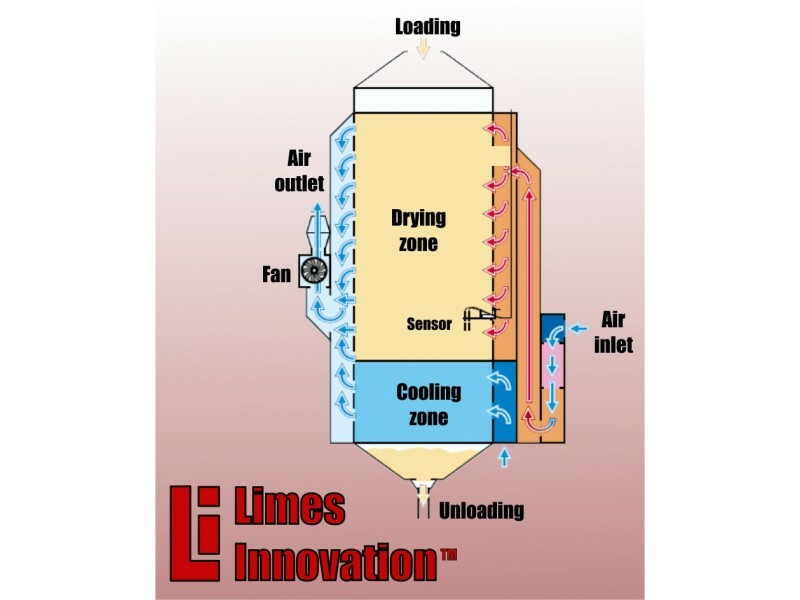 The LI dryers apply technology that uses constant circulation of hot air, fed by a gas/oil burner located in a combustion chamber at the bottom of the unit. The warm air is sucked in by a fan situated on the opposite side of the dryer. The grain is fed through the top opening of the dryer by belt conveyor or auger and falls into the loading area. Then the grain falls into the drying zone in which there are numerous channels (on the scheme) through which the hot air is conducted. The hot air is fed by a burner (gas/oil burner or a heat exchanger powered boiler) and on the opposite side of the dryer the air is sucked by a fan. In the drying zone continuously flowing stream of hot air is evenly distributed by multiple channels and passes several times through the dried grain thus utilizing the supplied heat to a maximum. In the drying zone there is a humidity sensor that measures the current moisture content of the production. After reaching the desired humidity the grain falls into the cooling zone, where is cooled naturally. From the cooling zone the grain is unloaded on conveyor belt. 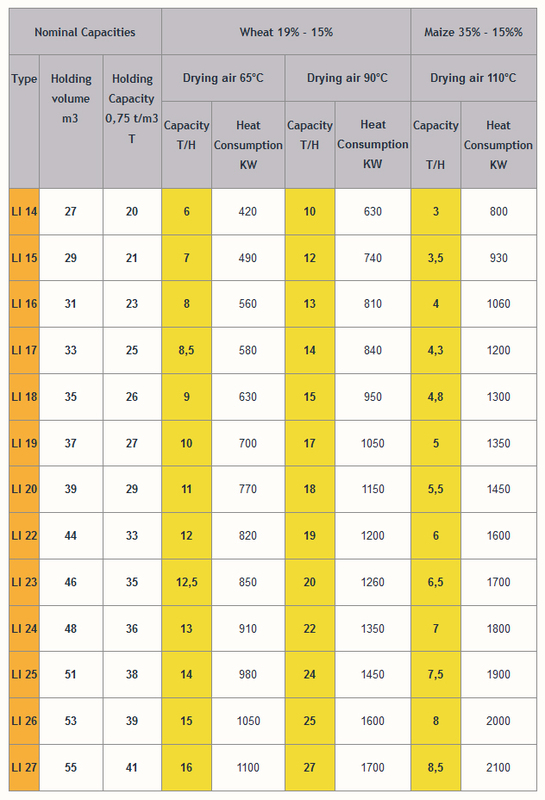 Our range of Continuous Flow Dryers LI are shown on the table below. The LI type Continuous Flow Dryers are used for drying grain, maize, wheat, barley and other cereals that require a reduction of the moisture percentage content to the respective standard values.